Groups and bus tours are welcome, but please call in advance so we can make arrangements to tailor a tour to your needs. A complete tour is $15 per person and requires a minimum of 20 visitors. You can tour our large state-of-the-art timberframe sugarhouse, see our evaporator in operation, sample products being made in our candy kitchen, visit our farm animals, see “Punkin Chunkin” with a huge trebuchet, browse our well stocked gift shop and take a guided wagon ride over our covered bridge and through the sugarbush to see how we gather the sap from the trees and how we manage our forest. 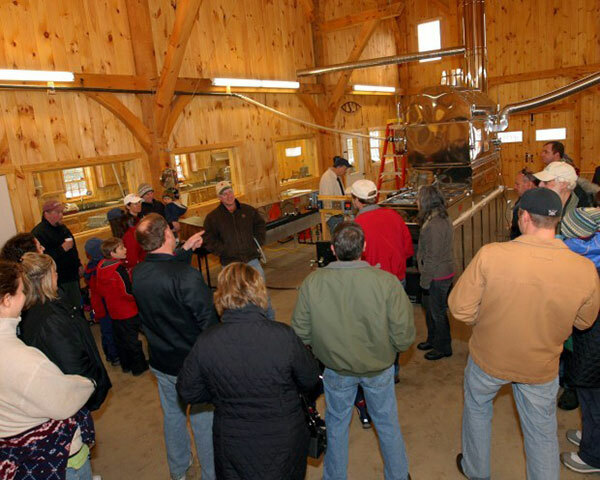 During your group tour you can see syrup being boiled in our evaporator and products being made in our kitchen. You can get a tour of our large state-of-the-art timberframe sugarhouse and take a guided wagon ride over our covered bridge and through the sugarbush to see how we gather the sap from the trees and how we manage our forest. You can visit some of the farm animals and see “Punkin Chunkin” with a huge trebuchet. You can browse our well stocked gift shop and best of all you can taste some of our products in our candy kitchen. Please call in advance so we can make arrangements to tailor a tour to your needs. A complete tour is $15 per person and requires a minimum of 20 visitors.